An international tribunal is set to give a long-awaited ruling, with implications for China's controversial claims in the disputed South China Sea. The case is being decided by an arbitration tribunal under the United Nations Convention on the Law of the Sea (UNCLOS) , which both countries have signed. However, observers say the decision could favour the Philippines - and China risks reputational damage if it does not abide by it. They also warn there is a risk that China could react aggressively to a ruling against it. The US has sent an aircraft carrier and fighter jets to the region, prompting an angry editorial in the Global Times , a strongly nationalist state-run newspaper, calling for China to prepare for "military confrontation". The tribunal has previously said it is the appropriate body to rule on at least seven of the 15 claims in the Philippines' case and was still considering the other eight. China has been trying to gather international support. Its diplomats have written a slew of articles setting out their government's position in English-language media around the world. China says about 60 countries support its stance that the tribunal's ruling should be rejected, but few have declared their support publicly. The Philippines brought a case in 2013 to the UNCLOS tribunal, contesting China's claims and activity in the South China Sea, saying that they were contrary to international law. 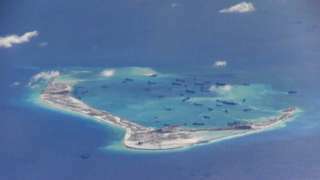 It has accused China of interfering with fishing, dredging sand to build artificial islands, and endangering ships, among other claims. It also asked the tribunal to reject China's claims to sovereignty over waters within a "nine-dash line", the dotted boundary that claims as much as 90% of the South China Sea, that appears on official Chinese maps. What is the impact of its ruling? According to Bill Hayton, author of South China Sea: The struggle for power in Asia, a large part of the case is about asking the court to decide what specific land features in the area are, and therefore how much claim to territory each country has. An island, which is able to "sustain human habitation or an economic life of its own", is given a 200-nautical mile exclusive economic zone around it. Therefore, if the tribunal rules that nothing that China occupies in the Spratly Islands is a proper island, it will be unable to claim land rights of 200 nautical miles. Although the ruling is binding, the tribunal has no powers of enforcement. However, the ruling could set a precedent for similar cases in future. China has boycotted the tribunal, saying that the panel has no jurisdiction. It has already said it will not "accept, recognise or execute" the decision. However, if the ruling favours the Philippines, China could risk reputational damage and be portrayed as a country that ignores international law, perhaps leading to greater tensions between China and the Philippines, or the US, which has sent significant military assets to the area. The Philippines' new President Rodrigo Duterte has said his country is willing to share natural resources with Beijing in contested areas even if the tribunal rules in its favour. Mr Duterte has adopted a more conciliatory approach to China than previous president Benigno Aquino, and it remains to be seen how the ruling will affect the two countries' relations.